There is nothing eye catching as enjoying a 1080p Blu-ray movies on Apple TV with family and friends in the comfort of your home. Externally, the Apple TV 3rd generation is virtually indistinguishable from the Apple TV 2nd generation. That difference is its support for native 1080p video, as streamed from iTunes, over the Internet, or via AirPlay from a third-generation iPad. Yeah, you can stream 1080p HD movies and TV shows your buy on the iTunes store for enjoying on your HDTV. However, it is well known that Apple TV supports very few file formats, which include MOV, MP4 and M4V videos, meaning BLu-ray cannot be playback on your Apple TV. Of course, most of you are not about to pay iTunes' ridiculous prices to watch movies and TV shows I already own on Blu-ray. Instead, you'll just rip those Blu-ray discs to an Apple TV friendly format. If you're interested in doing likewise, check out EaseFab Blu-ray Ripper for Mac. This program can help you effortlessly remove the proction of Blu-ray discs (including the latest Blu-ray movies) and convert them to Apple TV compatible videos with outstanding video quality and fast ripping speed. Moreover, you can choose the desired subtitle for output and select forced subtitles for some unknown languages. Besides, you can even rip Blu-ray to Apple TV format with AC3 5.1 audio track. 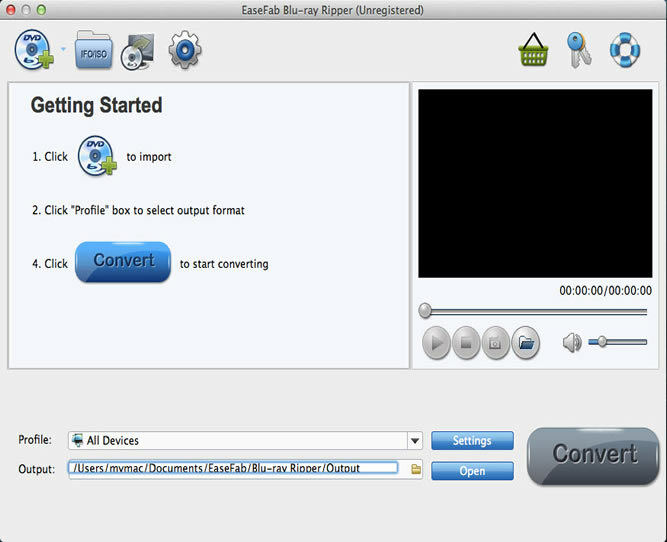 If you're running a Windows PC, simply turn to EaseFab Blu-ray Ripper, which allows you to convert Blu-ray to Apple TV in Windows (Windows 8/8.1/10). Now download the right version and follow the tips below to finish your task. Install and run the Blu-ray to Apple TV Converter on your Mac, insert your Blu-ray disc into the BD Drive that connected to your Mac computer. Then click the "Load Disc" button to have movies uploaded to the program. Here you can also import DVD folders, ISO files and IFO files to convert. Since regular Blu-ray movies usually have several subtitles like English, French, German, etc. You can click Subtitle to choose the one you need or select No Subtitle. For the audio tracks, simply click Audio Track and select the one you want. 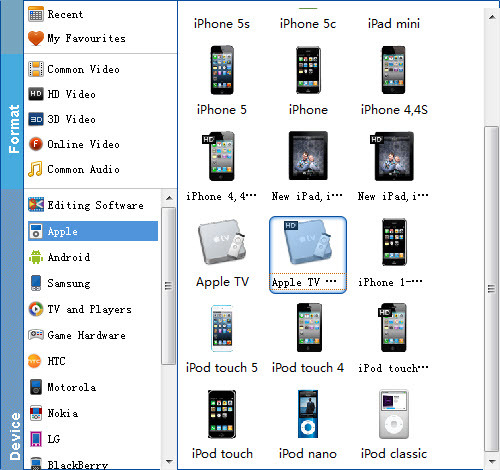 After that, click Profile box and choose "Apple TV" as the output file format from Apple category for your Apple TV. Currently the video presets for Apple TV and Apple TV HD are provided. If you want to play Blu-ray movies on Apple TV 3, you can choose Apple TV HD as the output format, which is perfect for the New Apple TV. Tweak your setting: The key setting Video Size for your new Apple TV is according to your source video exactly. If your source video is in 1080p such as Blu-ray, you can set your video size in 1920*1080. For playing movies on the Apple TV 3, 1080p with 4000~6000kbps birate is enough. After all necessary settings, simply click the big Convert button to start converting the added Blu-ray files to Apple TV compatible 1080p videos. Wait for the conversion to complete and click Open Folder to get the converted videos instantly. And then, just use iTunes to stream the files to Apple TV and enjoy them! Have a nice time! 1. Can the Apple TV 3 support AC3 5.1 audio? 3. Does the Apple TV 3 Dolby Digital Pass-through preset work with iPad? Yes. The preset also work with new iPad. It plays stereo by default. If you'd like to play surround sound effect, enable Airplay to have iPad stream the video to Apple TV 3, which pass-through AC3 audio to receiver.